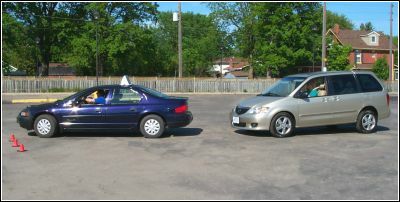 Part of your in-car training will involve collision avoidance techniques. Learning these techniques is vital to preventing collisions - even those that may be caused by other drivers. Threshold braking is accomplished by manipulating the brake pedal so that the tires are able to achieve maximum braking force without "locking up". This results in the shortest possible braking distance. The difference between ABS and non-ABS equipped vehicles is discussed in the training. 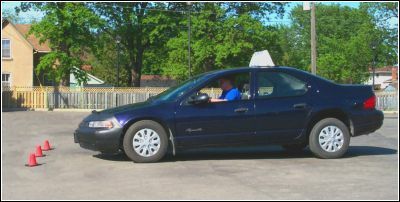 Another defensive driving technique is steering to avoid a collision. If there isn't enough time or space to bring the car to a stop before colliding with an object, then steering around the obstacle is the best option. This procedure is used when you are stopped at an intersection and the person in the car behind you has underestimated the distance required to come to a complete stop. To avoid being rear-ended, you make a sharp turn to the right.